ICL Health Algotene is one of the richest natural sources of mixed dietary carotenoid antioxidants that contains a comprehensive spectrum of important daily nutrients. 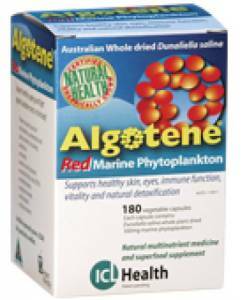 Algotene is the world`s first natural medicine multi-nutrient superfood supplement made from pure Dunaliella salinaan edible micro-algae rich in nutrients including vitamins, minerals, amino acids (proteins), essential fatty acids (EFA`s), carbohydrates, polysaccharides and chlorophyll. Children - 1-2 capsules daily or as advised by your healthcare professional. For children under 2 years seek medical advice. Use only as directed.